Check out our “secret” Keto Granola Bar recipe; we developed it from scratch. The secret is that it isn’t granola at all but full of healthy seeds and nuts. Great for breakfast or a snack the ingredients are full of healthy fats, vitamins, and minerals. 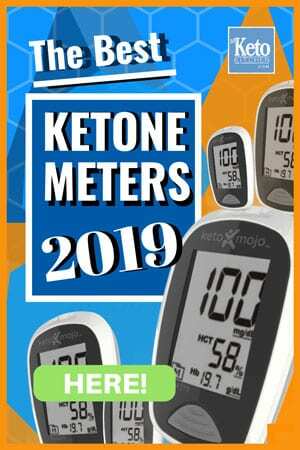 It can be a challenge to find a variety of shelf-stable keto snacks, and we’ve been doing our best to create some great recipes for busy Ketogenic Dieters. These low carb granola bars are grain-free, gluten-free, dairy-free, and sugar-free with no added cereal. Keep these tasty nut bars on hand, at work, before or after a workout or just as a quick snack on the run. 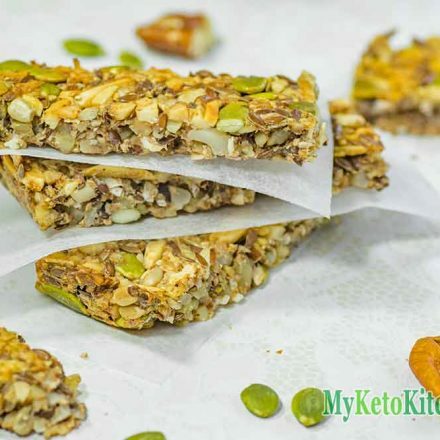 We’ve selected the lowest carb, highest fat containing nuts and seeds to make this keto granola bar recipe. Place the chia seeds into a bowl and add the warm water. Allow the chia seed to sit in the water for 5 minutes, until thick. Put the pecan nuts and macadamia nuts in your food processor and pulse (short bursts of blending) until the nuts are in smaller chunks, without turning it into flour. Mix the blended nuts with the almonds, sunflower seeds, pepitas, flaxseeds, and coconut. Add the egg, vanilla, cinnamon, and the Natvia icing mix into the thickened chia seeds. Mix the dry and wet ingredients and spread onto a lined baking tray. Bake in the oven for 20 minutes then remove and cut into 16 bars. Spread the bars over a larger baking tray and return to the oven for a further 10 minutes to crisp up. How to make Keto Granola Bars. 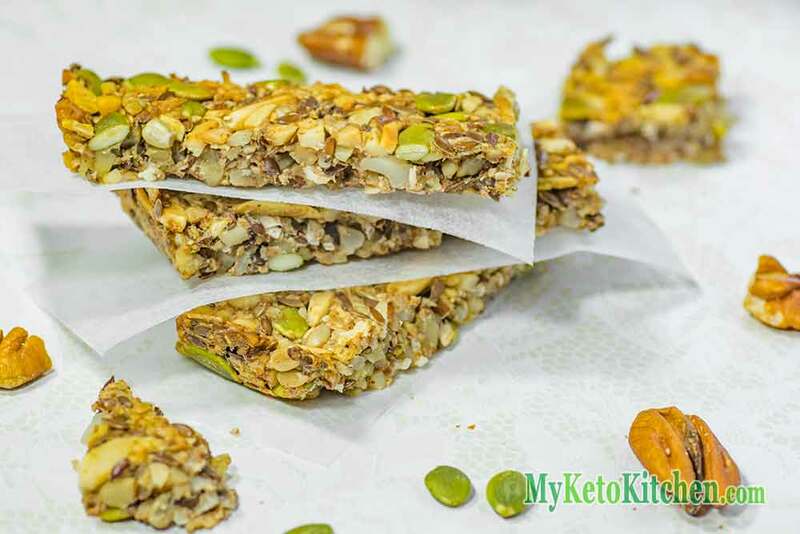 Our Super Easy "Secret" recipe for Low Carb Cinnamon Keto Granola Bars. They're grain-free, gluten-free, dairy-free, and of course, sugar-free. They contain so many healthy fats, vitamins and minerals to list. Place the chia seeds into a bowl and add the warm water. Allow to sit for 5 minutes, until thick. Blend the pecan nuts and macadamia nuts in your food processor until the nuts are in smaller chunks, without turning it into flour. Add the egg, vanilla, cinnamon and natvia into the thickened chia seeds. Mix together the dry and wet ingredients and spread onto a lined baking tray. Spread the bars over a larger baking tray and return to the oven for a further 15 minutes to crisp up. Remove from the oven and allow to cool. After they have completely cooled, store in an airtight container. 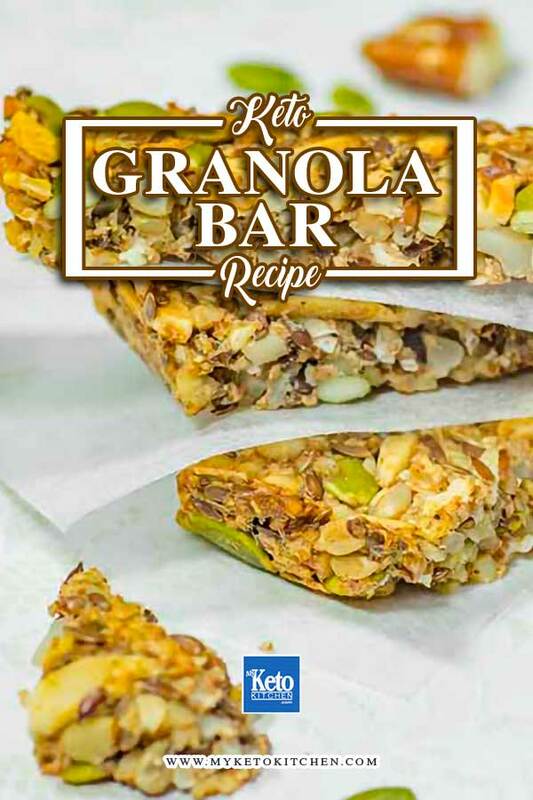 If you want to make a larger batch of Low Carb Granola Bars, simply adjust the serving amounts in our easy to use recipe card above. Keto Cereal Recipe – Breakfast Cinnamon Crunch – Sugar Free & Gluten Free! Can u mask this th l with out the Chia seeds? You can replace the chia seeds with flaxseeds and prepare them is the same way, flaxseeds and chia seeds are quite similar and will both create a gelatinous mix. You could use your preferred powdered sweetener. Best Keto Asian Recipes – Low Carb “Exotic Flavors” to Make at Home!